A shot of the valley going over the Vee, the Galtee mountains in the backround. The Bridge from the previous posting is at the bottom of the valley in the picture. this is another shot taken beside the bridge again that should have gone up in the last post. 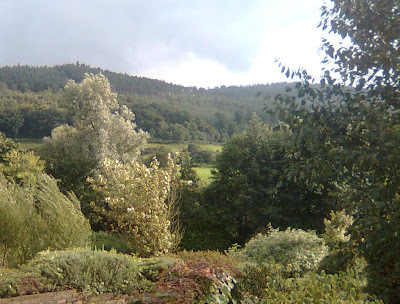 This is the other side of the mountain on the Waterford side, this is near the lovely hotel there the Bracken house where I was based while working here. This is another tributary of the Blackwater river, and is in the middle of a dense old wood. It is pretty cool to drive through it, then to go out on to the openness of the mountains. This is another bridge on the Knockmealdown mountain range that runs the border of Tipperary and Waterford, this is on the Tip side of the mountain. Knockmealdown means Hill of Maoldomhnach. This bridge is on the decent from the Waterford side going into the village of Clogheen. There are a few hairpin turns with a hundred metre drop. This the other side of the bridge, my geography is not the best but from the direction I think the mountain range in the distance is the Galtee mountains. If you look at the earlier post of Tipperary there is a picture of the Glen of Aherlow taken from the other side of the Galtees. I was driving on the road between Lismore and Clogheen and saw a little bridge, there was not a lot to see from the road. but there looked like a footpath so I decided to have a look and saw this lovely little valley that was hidden from the road. There is a lot of lovely views on this road, it is signposted as "the Vee", but unfortunately it was overcast, the tops of the mountains did not look that great with cloud cover. I liked this shot with the heather and different types of plants framing the little mountain stream, the awful thing about this stream was a lot of plastic bags and rubbish that got carried downstream. Its a pity that people dump their sh!t in scenic area's. This picture does not have all the heather that the other picture has but the rocks have a purple tint. This is a shot from the ditch on the side of the road as you can see there is little sign of the little valley. The heather and the bushes hide the Valley. This is the little valley that the little stream has carved out, either the stream gets more powerful with a lot of rain during the winter or it has taken a long time to cut this out. I know its only cutting through clay but its pretty nice. I put up a post this afternoon when I thought I would be leaving the the heritage town of Lismore, I explained that this castle belongs to the dukedom of Devonshire and has been in that family since the 1750's, they unlike a lot of English landlords were great benefactors to the local community in the past especially during the famine and even today continue to develop the area with arts etc. Here again is Lismore Castle, I was told by some of the locals that the Duke of Devonshire gave the castle and the grounds to his son as a wedding present. Some people complain about getting hand-me-down wedding presents I don't thinks he will complain about this one. 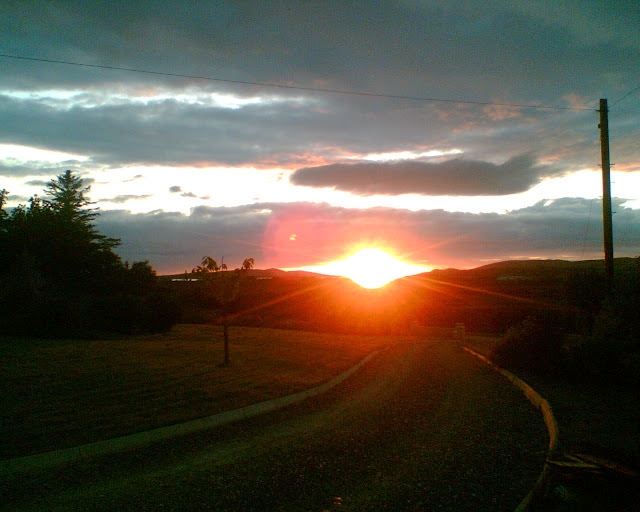 It sits overlooking some of the most beautiful scenery in this side of the country, the Knockmeldown mountains. It also has good fishing. This is the bridge that the previous picture was taken from. There is a nice drop from the walkway to the bank , the only people who brave this slippery walk to the bank is the fly fishermen, this was taken at sunset from the spot where the fly fishers cast off Again this is the Castle taken further down the river, there is a nice walk down the river Blackwater. There is a nice walk down by the banks (once you pass the water treatment plant). This was a shot of the Castle from the other side of the river, when i was walking back to the hotel I saw a little roadway beside the old mill, otherwise there is a huge drop from the side of the bridge. This is just one views from the walk along the river, it is worth the longish walk to get the view of the castle along the river, there is about a 30 foot drop down to the river at this point which is not clear from this picture. This is Lismore Castle in the heritage town of Lismore Co Waterford it has been in the family of the Duke of Devonshire since the 1750's. It has 4000 acres just over 6 square miles. This is a random little road near Carrig on suir not often that these are on national routes. This is where I stayed in the legends B&B behind the Rock of Cashel amazing views, I did ask if i could publish. This is the signpost on the Tipperary border with Limerick. Tomasc Treda is the guy in yellow, he only let his photo up if he got a mention. The weather was very bad all morning, open the picture and look at the writing above his left arm. Again another taken from the bridge before I left as can be seen the clouds are starting to darken so it was time to go. This technically might be Kilkenny, as this is taken from the Kilkenny side of the river that is the border between the two counties. This picture was taken just outside Carrick on Suir with the rain lashing down, the poor cows were trying to get some shelter against the ditch. This is spot between Bansha and Tipperary town on the N24 if you open the pic you'll see a little stream, this is just after the Glen of Aherlow. 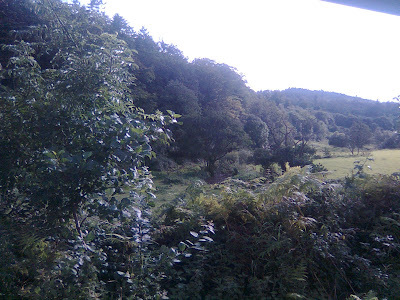 This is after the other one again on the N24 looking at the hills south the of the town of Tipperary. This is the Castle in Cahir, I did not have time to take close up shots of the castle but there are still cannon balls stuck, I am not sure if you can see on this one when opened, also if opened you can see the dirt of the river on the bottom of the pic. I would have taken a better picture with the old bridge and the river but because of random tourists standing in the way and debris in the river after all the rain this was the best i could do. 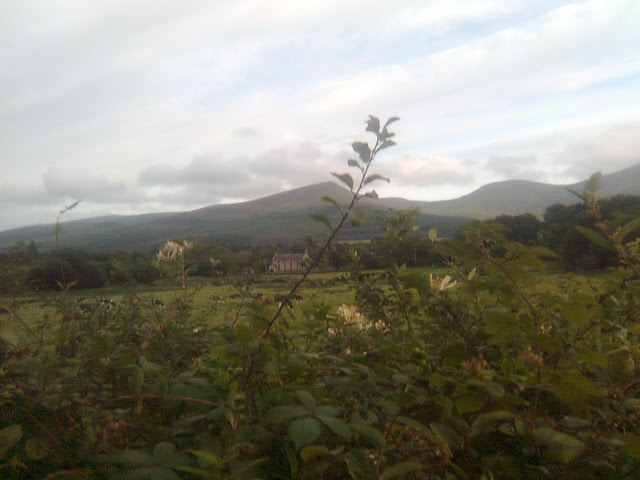 This was taken in the Glen of Aherlow, what I thought was strange this was the view of the valley in front of the Glen Hotel, if they cut the hedge a small bit. It was only by chance that i looked over it while trying to get coverage for my phone. the little church in the centre cannot be seen from the road way. I must admit that I did not take all of these pictures, a colleague from Holland took two of these on a day trip that we took while working one Sunday. 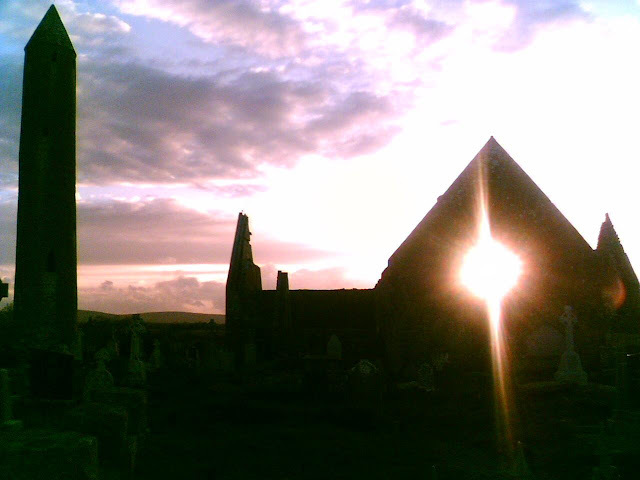 This is Kilmacduagh monastery, it is a 5 minute drive from Gort in south Galway. It it is the ruin of a monastery from the middle ages. 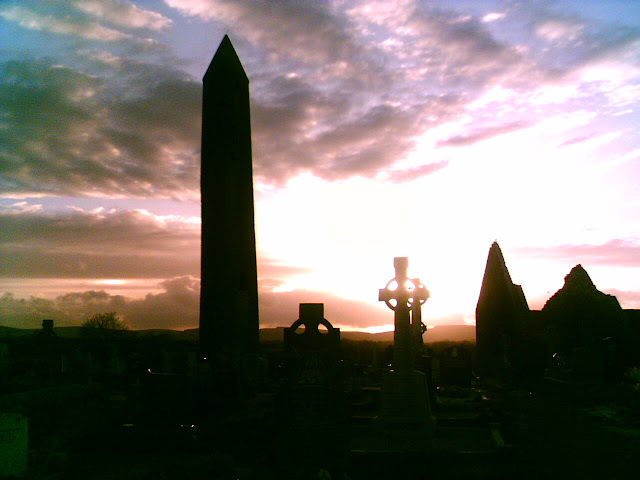 These were not just places of religion but were also colleges the most famous one is on the river Shannon. This is one that Rob took we got to it just at sunset. As you see from this picture the tower is at an angle, these were used as a place of refuge from attack from the Normans and whomever decided to try to liberate the monks of their gold and prised possessions. the door was half way up the the tower and was gotten to by ladder that was withdrawn into the tower. Because of its round design it was able to withstand attack from battering ram. 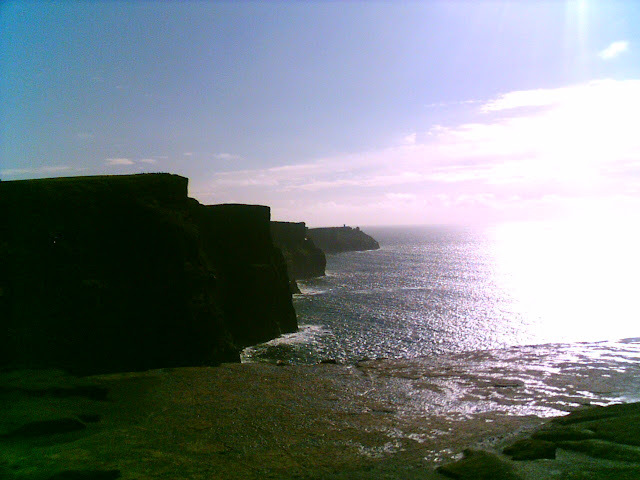 These are the Cliffs of Moher taking one Sunday morning, where I went to clear my head after a tough night on the beer in Kenny's bar up the road in Lahinch. I liked the contrast of the cliffs in this picture more than the others that I have taken. Kerry has to be one of the most photogenic ares in Ireland and the people of that county are quite smug about that fact :). These pictures are from the southern leg of the Ring of Kerry , I will have other pictures from kerry to upload in the future. This cottage ruin is on the the Cahirsiveen to Kenmare run of the ring of Kerry, this section of the ring is not as popular as the Killarney to Kenmare leg as the lakes and mountains there are breathtaking. This is south east of Kenmare on one of the regional roads, like the last picture i liked the way the mountains roll off into the backround. 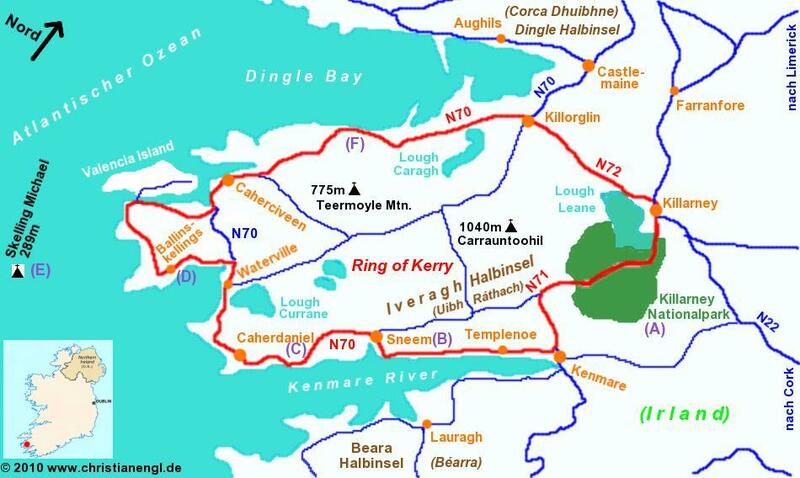 This is not on the Ring of Kerry. 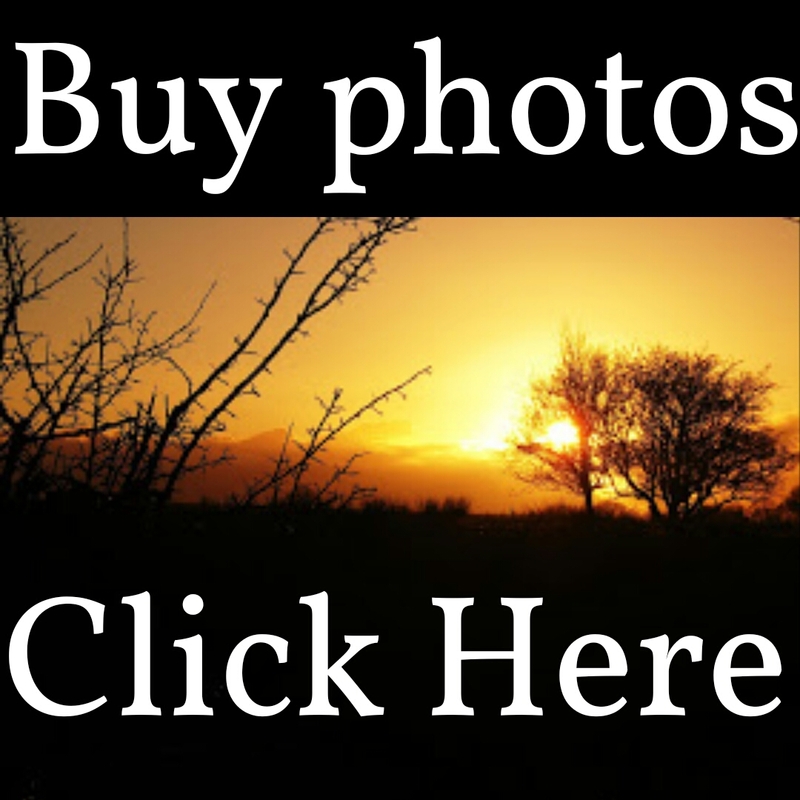 As i am from Galway i started with a picture taken behind my home in Galway. 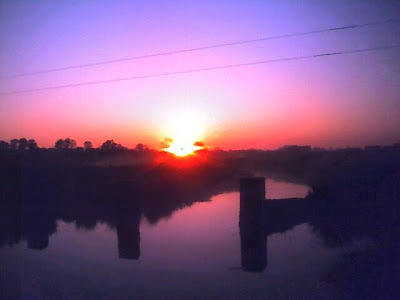 This was taken at 5:30 in the morning with a Treo Palmphone so the quality is not brilliant. The three pillars that make the shadows across river are from an old footbridge, that was used in my great grandfathers time. It was also used to mark the division between town lands.